Sexual Dimorphism Males are slimmer and develop small glands behind their front legs. In mature frogs, the female may be considerably larger. Females also have a visible tail bud. Compatibility Community - with caution. Adult frogs should not be kept with tiny fish/fry. Do not keep alongside large, aggressive/nippy fish which may prey on the frogs. In the wild, African Dwarf Frogs are known from creeks, ponds, streams, shallow rivers, and, during the rainy season, in flooded areas of the forest. Here they spend much time on the substrate looking for food, their colouration allowing them to blend in with the mud and leaf litter. African Dwarf Frogs are fully aquatic, but they do need to come up and take warm air from above the water's surface periodically. It is therefore essential that the tank is not too deep (ideally less than 18") and you should leave a small gap between the surface of the water and the coverslides/lid. Substrate choice is important: it either needs to be too large (pebbles) or too fine (aquatic sand) to swallow, so that the frogs are unable to accidentally ingest it when lunging for food. Ingestion of gravel can be fatal. Sand is the preferred choice as not only should it pose no problems for the frogs when feeding, it is much easier to keep clean, as it is all too easy for uneaten food and other waste products to build up amongst coarse grained substrates. Filtration should be efficient, but water movement fairly gentle. It may be prudent to place a coarse sponge or filter bag/mesh over the intake pipe cage to prevent the frog's legs from being drawn in and subsequently trapped by the flow. As frogs are not able to regulate their body temperature internally, they rely on their environment being the appropriate temperature for them to be comfortable, so ensure water temperature is steady. Hiding places should be provided amongst smooth rocks, driftwood, flowerpots turned on their sides, and hardy aquatic plants. African Dwarf Frogs are very sociable and should be kept in small groups. They are generally peaceful towards fish of similar size, but tankmates must be chosen carefully as adults will take small fish and fry. Do not house with any large, aggressive/nippy species. The African Dwarf Frogs will spend most of their time at the bottom of the aquarium, however, from time to time, they may appear to float in one spot with all limbs outstretched. This meditative state is normal and is known as burbling. Ensure there are no escape holes in the top of the tank as these frogs, unsurprisingly, are expert jumpers and they cannot survive out of water for long. Be sure not to confuse African Dwarf Frogs (Hymenochirus spp.) with African Clawed Frogs (Xenopus laevis). The latter grow much larger and require a species-only aquarium due to their predatory nature. To tell the difference: African Dwarf Frogs have four webbed feet, whereas African Clawed Frogs have webbed hind feet and autonomous digits on the front feet. Furthermore, the eyes of the African Dwarf Frog are positioned on the sides of the head, and those of the African Clawed Frog are set on the top of the head. Finally, the snouts of African Dwarf Frogs are pointed, and those of the African Clawed Frogs are flat and more gently curved. Carnivorous. 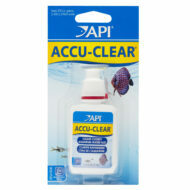 Offer a variety of foods including sinking pellets/granules (such as Tetra ReptoMin) and meaty frozen foods such as white mosquito larvae, bloodworm, daphnia, vitamin-enriched brineshrimp, finely chopped mysis shrimp/krill/prawns. If fish are present in the same aquarium, the frogs may need target feeding. African Dwarf Frogs mate in what is known as amplexus (Latin for 'embrace'). This is a type of direct contact mating behaviour exhibited by some externally fertilising species, including amphibians. 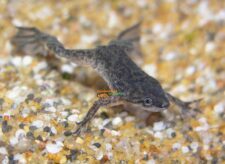 The male African Dwarf Frog grasps the female's abdomen just in front of her hind legs using his front legs, and at the same time, or with a little delay, he fertilises the eggs as the female releases them. Amplexus usually happens at night, after one or more nights of courtship 'singing' by the male. Once in the amplexus position, the male will hold onto the female for several hours. If the female is receptive, she will repeatedly swim to the surface and dive back down in a circular pattern, whilst towing the male. As she nears the surface each time, sticky eggs are released, the male releasing sperm simultaneously to fertilise them. Eggs usually number 50-400, although 750+ from particularly large females is not unheard of. The adults will predate on the eggs so are best acclimatised to another aquarium. Hatching should occur within 2-5 days (temperature dependent) and the resulting 3-4mm tadpoles will require feeding with infusoria, moving on to baby brineshrimp and microworms when large enough. Approximately 6-8 weeks post hatch, the tadpoles will metamorphose into tiny frogs.